In KiSSFLOW, you cannot change the email addresses associated to an individual account. If you need to change the email address for a user, you will have to create a new account. Historical data will not pass on to the new account, but you can pass on current and pending tasks. Here are the steps to add a new account and link it to an old one. Note that you will need to be a User Admin, Super Admin, or Account Owner to complete most of these steps. Send an invite to the new email address of the user. Delegate all future tasks to the new user from the User Management tab. Reassign any current tasks to the new user from the User Workload Report. From the User Management tab, switch the status of the old user to Inactive. To know how to deactivate a super admin, click here. After adding the new user, follow these steps to make sure all of your processes run smoothly. In the User Management tab, make sure the new user is assigned to the right Department, Reporting Manager, Groups, etc. Also check for other users whose Reporting Manager is this new user. In each app, you will need to make sure the new user is added to the Who can start this app? part of the Define Workflow section. 3. 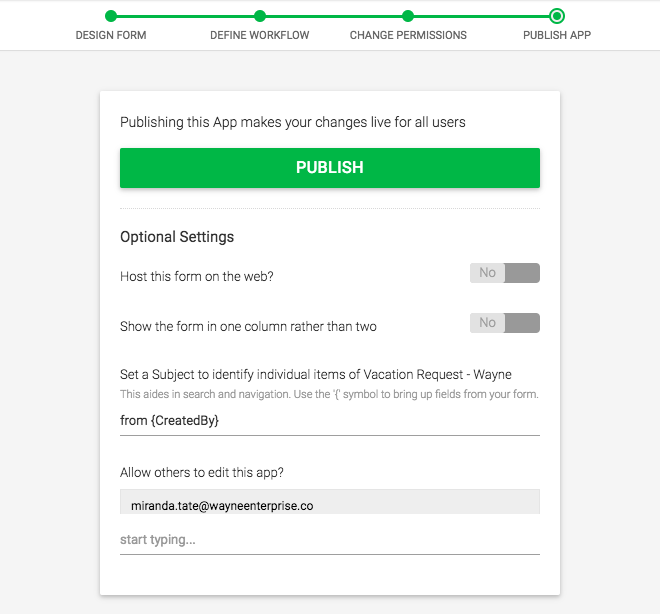 If you want the user to be an App Admin for any apps, you will need to add them on the Publish App section. 4. Check to make sure both Masters and Reports are shared with the new user. 5. Check all of your Masters for any instance of the old user’s email address, and update it to the new user’s email address.